Minutes before she died, Grace Cahill changed her will, leaving her descendants an impossible decision. “You have a choice – one million dollars or a clue.” Grace Cahill was the last great leader of the Cahills, the world’s most powerful family. Everyone from Napoleon to Houndini, Mozart to Benjamin Franklin is related to the Cahills, yet the source of the family power is lost. 39 clues hidden around the world will reveal the clan’s secret – but no one has ever managed to assemble them. Now the race is on. 39 clues to unscramble. One huge puzzle to solve. Are you up to the challenge? Join the world’s most powerful family clan as they race against time to solve the shattering secret of their heritage. 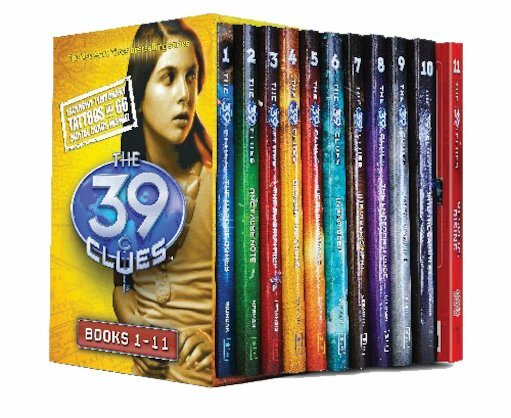 A brilliant boxed set of the must-read series, containing the first eleven books!